In the partner area you have the opportunity to see your details. You simply enter your partner number and password and click on continue. You are not a partner? Click here! 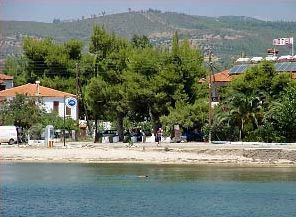 Das Hotel Irini befindet sich am wunderschönen Sandstrand von Psakoudia, zwischen den 2 Halbinseln Kassandra und Sithonia und ist etwa 80 Km. vom Flughafen Thessaloniki entfernt. Das blaugrüne Meer und pinienbewachsene Wald machen Psakoudia zu etwas ganz besonderen. In dem deutsch-griechisch geführtem Haus in Nea Potidea erwarten Sie 16 gepflegte Appartements für 2-4 Personen. Geniessen Sie den Strand, das schone blaue Meer und die griechische Gastfreundlichkeit, gepaart mit deutscher Grundlichkeit. 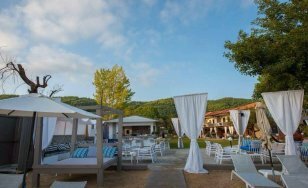 Urlaub in Halkidiki - Wir machen Ihren Urlaub zum Erlebnis - ! Wir bieten Ihnen als Urlaubsanbieter direkt vor Ort, jede Art von Service. 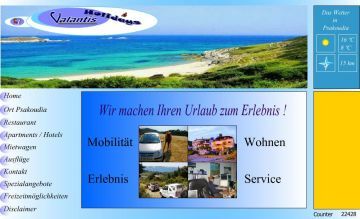 Zimmer, Apartments, Mietwagen, Ausflüge und Beratung. 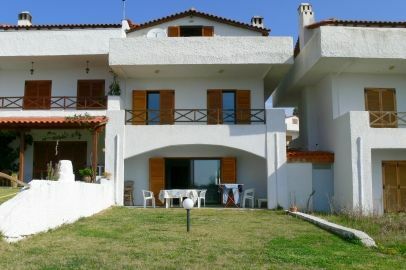 Besuchen Sie unser Ferienhaus auf der Chalkidiki, einer Halbinselgruppe im Nordosten Griechenlands. Neben einer schönen Natur, mit Bergen und Wäldern, erwarten Sie wunderschöne Strände, die zum Erholen einladen. 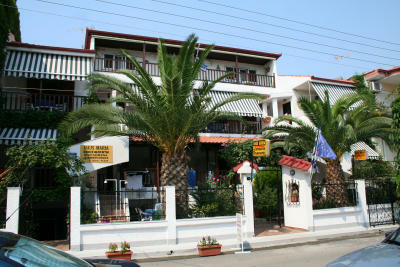 Das Haus Sunset Studios befindet sich auf der Südspitze des zweiten Halbinselfingers von Chalkidiki im Ort Toroni und wird familiär geführt. Es verfügt über 3 Zweibettstudios, 2 Dreibett-studios und ein 2-ZimmerAppartment mit Meerblick. Verbringen Sie Ihren Urlaub in Nea Potidea, einem der schönsten Orte in Chalkidiki. Erleben Sie einen traumhaft schönen Sandstrand, genießen Sie das Leben in zahlreichen Tavernen und nutzen Sie die vielseitigen Unterhaltungsmöglichkeiten. Unses Hotel Marina befindet sich auf der Halbinsel Sithonia beim Dorf Nikiti (100 km von Thessaloniki entfernt), einen Katzensprung vom Meer entfernt. Wir sind ein Familienunternehmen, das das ganze Jahr über 10 Zimmer (7 Doppelzimmer, 2 Dreibettzimmer, 1 Vierbettzimmer) anbietet. 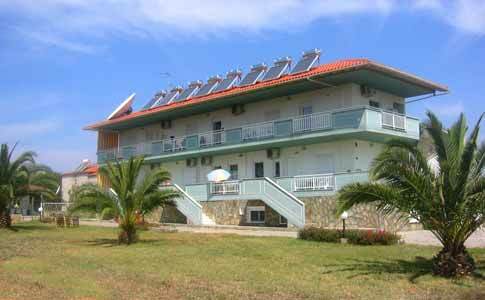 Located right on Perea Beach, Peraia Rooms offer rooms and studios with a balcony and free WiFi access. Several café bars and tavernas can be found a few metres away, while Macedonia International Airport is 10 km away. Featuring a private beach, an outdoor pool and a BBQ area, Angelbay Bungalows is situated in Agia Triada, a 30-minute drive from the lively centre of Thessaloníki. Set amidst a blossomed garden, the property offers free WiFi throughout. 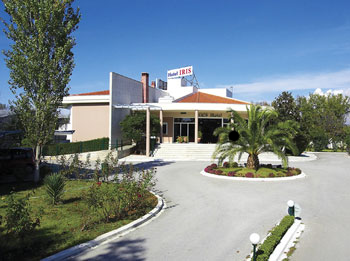 Hotel Heaven is situated among the lush hills of Tagarades with a panoramic view of the city and the Thermaic Gulf. 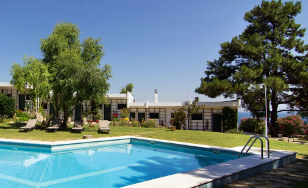 It features a large salt-water swimming pool, a bar with city views and a spacious lobby with free WiFi internet access. Free private parking is available. Zinozis Beach Apartments are located inside a 6 sq. 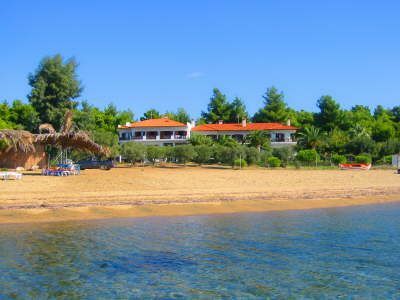 meter green place full of trees, besides the sea in Vourvourou Halkidiki. A true oasis for those who desire to relax, to calm and to have a luxury summer vacation. There are 16 fully furnished Studios & Apartments on the ground floor and first floor , and a 65 square meter house (villa) for rent . They all have wonderful view of the sea and Diaporos island. 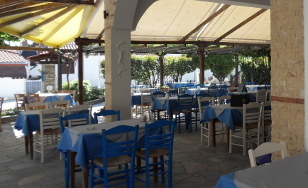 Tavern „Ta Tria Skalopatia“ in Nikiti Situated 80 m from the beach, the family run restaurant "The three steps" offers its guests traditional Greek cuisine with daily specials, a big variety of appetizers and fresh fish. In the shady restaurant garden you can „cool down“ with a cold soft drink or a Nescafe Frappé while using the free Wi-Fi. 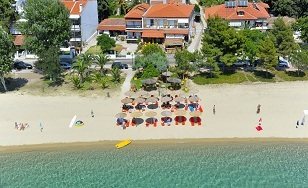 Located at the Thermaikos bay in the centre of Perea's sandy beach, on the outskirts of Thessaloniki, this hotel provides comfortable accommodation at value-for-money prices. 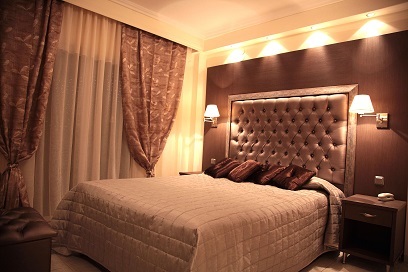 Hotel Avra offers a quiet environment, suitable for leisure and business. The hotel is conveniently located for your business activities being just a 20-minute drive from the centre of Thessaloniki and a 10-minute drive from the airport. Conveniently located in Thermi, just 1 km from Thessaloniki International Airport, Iris features free Wi-Fi in public areas and free private parking. The air-conditioned rooms have soundproofing and private balconies.